The palm that launched a thousand kilometers. Spent some time working with my rando wheels today (asthma has made this week a pretty sucky training week, so I had to have fun where I could find it). Everything on the bike is a trade-off. It’s kind of like the old saw about a programmer who walks into a meeting and says, “There’s features, there’s speed, and there’s cost. Pick any two.” Giving yourself the best aerodynamics will sacrifice comfort and bike handling (the latter to the point where road riders won’t ride with you if you go full aero). Going maximum comfort will sacrifice all aerodynamics, and bike handling will be kind of moot because you don’t have to worry about what the road riders think about your bike handling because you’ll have been dropped a looooooooong time ago. So it is with wheels. I’ve already talked about the sturdy wheels I made for randonneuring (rando). The problem with a randonnée is that it is entirely self-supported. You have what you bring and what you can buy, beg, borrow or steal on the road. That’s why I built a 36-spoke wheel when most bikes intended to handle high-weight folks use 32-spoke wheels and most fast wheels use a lot less (my race wheels use 24 spokes). With 36 spokes I can be assured that my wheels will still hold their shape if one of my spokes should choose to join the bike shop choir eternal, although with the quality of spokes I use, this is highly unlikely (DT Swiss Competition butted spokes, for anyone keeping score). I have also chosen tires that are notorious for the ability to take abuse but still be supple enough to give me a decent ride. I ride Continental Gatorskin tires, 25 mm in the back (for comfort) and 23 mm in the front (for less rolling resistance). I also use wide rims (23mm Velocity A23 rims) to give my tires a nice shape and good cornering characteristics. 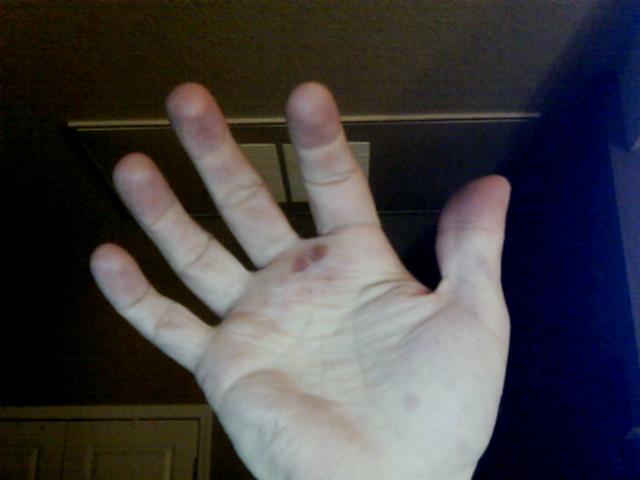 This is what happens to your hand when you mount hard-to-mount tires on quality rims. Crusty bike mechanics will have a pretty hard callus underneath the fingers, but most of the tires I mount are a lot easier to get onto my rims. So when I mount tires on rims this is what happens (the two holes under my fingers…. ignore the burn at the base of my thumb which is the result of a grease splatter from cooking dinner for The Bride). Ideally tires should be mounted without resorting to tire irons. Unideally, this is what happens when you do and the flesh on your hands isn’t up to the strain. Incidentally, my race wheels (Easton EA50 Aero) and tires (Panasonic light racing tires) do much the same thing. This will be something I need to work on before rando season rolls around. This is the equipment I want to use, and if I flat while riding in a group they won’t be willing to hang around (nor should they) if I spend more than 5 minutes worrying my tire back on the rim. It’s the one thing that gives me pause, and I have ’til April 20th to get behind this particular problem. I think I’ll ask to mount all the tires that come into the shop from now ’til then! This entry was posted in Equipment, Shop Techniques and tagged bicycle, cycling, race wheels, randonneuring, rim design, tires, wheels. Bookmark the permalink.